I. Ihm, On Surface Design with Implicit Algebraic Surfaces, Ph.D. Thesis, Dept. of Computer Sciences, Purdue University, July 1991. J.-H. Park and I. Ihm, "A Linear-Time Algorithm for Finding a One-to-Many 3-Disjoint Path Cover in the Cube of a Connected Graph," Information Processing Letters, Vol. 142, Issue 2, pp. 57-63, February 2019. I. Ihm and J.-H. Park, "A Linear-Time Algorithm for Finding a Paired 2-Disjoint Path Cover in the Cube of a Connected Graph," Discrete Applied Mathematics, Vol. 218, pp. 98-112, February 2017. W.-J. 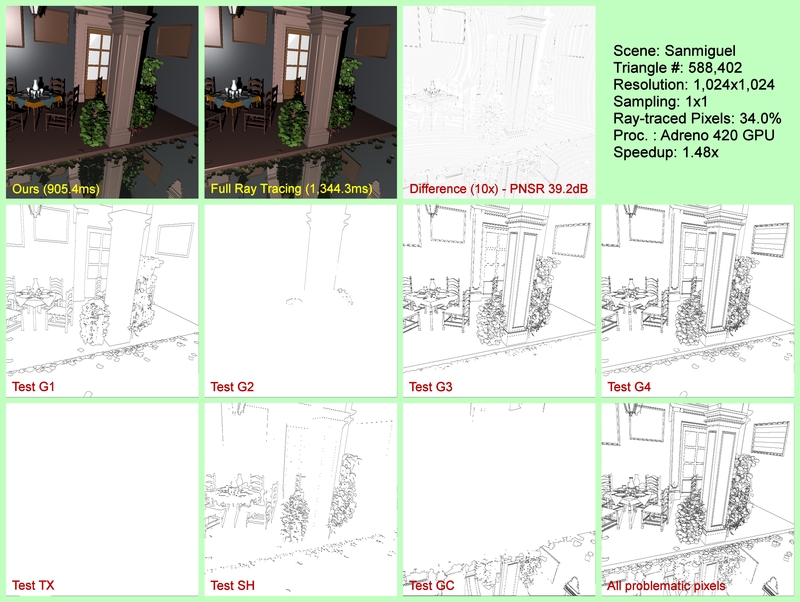 Lee, S. J. Hwang, Y. Shin, S. Ryu, and I. Ihm, "Adaptive Multi-Rate Ray Sampling on Mobile Ray Tracing GPU," SIGGRAPH Asia 2016 Symposium on Mobile Graphics and Interactive Applications, Article No. 3 (5 pages), Macau, December 2016. B. Choi, W. Seo, and I. Ihm, "Enhancing Time and Space Efficiency of Kd-tree for Ray-tracing Static Scenes," ACM SIGGRAPH 2015 Posters, August 2015. J.-H. Park and I. Ihm, "Many-to-many Two-disjoint Path Covers in Cylindrical and Toroidal Grids," Discrete Applied Mathematics, Vol. 185, pp. 168-191, April 2015. J.-H. Park and I. Ihm, "Disjoint Path Covers in Cubes of Connected Graphs," Discrete Mathematics, Vol. 325, pp. 65-73, June 2014. J.-H. Park and I. Ihm, "Single-Source Three-Disjoint Path Covers in Cubes of Connected Graphs," Information Processing Letters, Vol. 113, Issues 14-16, pp. 527-532, July-August 2013. J.-H. Park and I. Ihm, "Strong Matching Preclusion under the Conditional Fault Model," Discrete Applied Mathematics, Vol. 161, Issues 7-8, pp. 1093-1105, May 2013. J.-H. Park and I. Ihm, "Strong Matching Preclusion," Theoretical Computer Science, Vol. 412, Issue 45, pp. 6409-6419, October 2011. H. Kim, I. Ihm, and K. Choi, "Generation of Non-Uniform Meshes for Finite-Difference Time-Domain Simulations," Journal of Electrical Engineering & Technology, Vol. 6, No. 1, pp. 128-132, January 2011. I. Ihm, B. Chang, H. Lee, T. Chung, J. Braunstein, H. Kim, "An Algorithm for Generation of Non-uniform Meshes for Finite Difference Time Domain Simulations," The 12th Biennial IEEE Conference on Electromagnetic Field Computation 2006, Miami, U.S.A., April 2006. I. Ihm, B. Kang, and D. Cha, "Exploring Chemical Kinetics for Fluid Animation (Abstract)," Symposium on Scientific Visualization in the Computational Sciences and Engineering (8th US National Congress on Computational Mechanics), Austin, U.S.A., July 2005. I. Ihm, H. Kim, and B. Chang, "Effective Generation of Nonuniform 3D Meshes for Finite-Difference Time-Domain Simulations," COMPUMAG 2005: The 15th Conf. on the Computation of Electromagnetic Fields, pp. 12-13, Shenyang, China, June 2005. H. Kim, I. Ihm, W. Min, and T. Chung, "An Effective Mesh Generator for the Large Complex Model with Abrupt Regions Using Efficient Node Placements," ASAEM 2003, pp. 117, Seoul, Korea, October 2003. S. Park, S. Park, C. Bajaj, and I. Ihm, "Hardware-Accelerated Multipipe Parallel Rendering of Large Data Stream," Israel-Korea Binational Conference on Geometric Modeling and Computer Graphics, pp. 45-55, Seoul, Korea, October 2001. C. Bajaj, I. Ihm, S. Park, and D. Song, "Compression-Based Ray Casting of Very Large Volume Data in Distributed Environments," HPC-Asia 2000: The Fourth International Conference/Exhibition on High Performance Computing in Asia-Pacific Region, pp.720-725, Beijing, China, May 2000. C. Bajaj, I. Ihm, and S. Park, "Making 3D Textures Practical," Pacific Graphics '99, pp.259-268, Seoul, Korea, October 1999. S. Park, G. Koo, and I. Ihm, "Wavelet-Based 3D Compression Schemes for the Visible Human Dataset and Their Applications," The Visible Human Project Conference '98, Maryland, U.S.A., October 1998. I. Ihm, and S. Park, "Wavelet-Based 3D Compression Scheme for Very Large Volume Data," Graphics Interface '98, pp.107-116, Vancouver, Canada, June 1998. I. Ihm, and R. Lee, "On Enhancing the Speed of Splatting with Indexing," IEEE Visualization '95, pp.69-76, Atlanta, U.S.A., October 1995. V. Anupam, C. Bajaj, S. Cutchin, S. Evans, I. Ihm, J. Chen, A. Royappa, D. Schikore, and G. Xu, "Scientific Problem Solving in a Distributed and Collaborative Geometric Environment," 3rd International Conference on Expert Systems for Numerical Computing, pp. 17-19, West Lafayette, U.S.A., May 1993. I. Ihm, Method and apparatus of camera tracking for streaming images from depth camera, Korea Patent #10-1793975, October 2017. I. Ihm and J. Kim, Method of producing panoramic video having reduced discontinuity for images, Korea Patent #10-1741699, May 2017. I. Ihm, Depth map filtering and two-level predictor-corrector method for precision enhancement of RGB-D camera pose estimation, Korea Patent Application #10-2017-0022963, February 2017. I. Ihm, S. Na, W. Seo, and Y. Kim, Method for rotating virtual camera on touchscreen-based device, Korea Patent #10-1420727, July 2014. I. Ihm, B. Choi, and B. Chang, Method and apparatus of processing polygon data of spatial acceleration structure, Korea Patent #10-1373174, March 2014. I. Ihm, B. Chang, and B. Choi, Method for constructing an intersection-test acceleration data structure based on polygon importance, Korea Patent #10-1228118, January 2013. I. Ihm and D. Cha, Rendering method for indirect illumination effect, Korea Patent #10-0951121, March 2010. I. Ihm and J. Oh, Technique for graphics data processing and transformation of linear expressions, designed for graphics processor, Korea Patent #10-0533883, November 2005. I. Ihm and H. Kang, Method for generating stereoscopic image from 2D images, Korea Patent #10-0436904, June 2004. 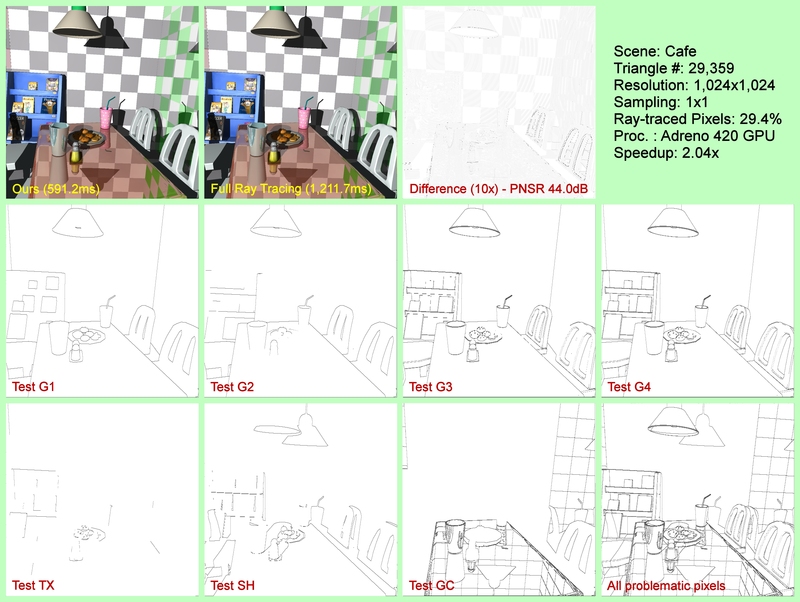 B. Choi, S. Kim, and I. Ihm, "Analysis of Spatial Acceleration Structures for Efficient Implementation of Ray Tracing", Journal of KIISE: Computing Practices and Letters, Vol. 17, No. 12, pp. 640-645, December 2011. 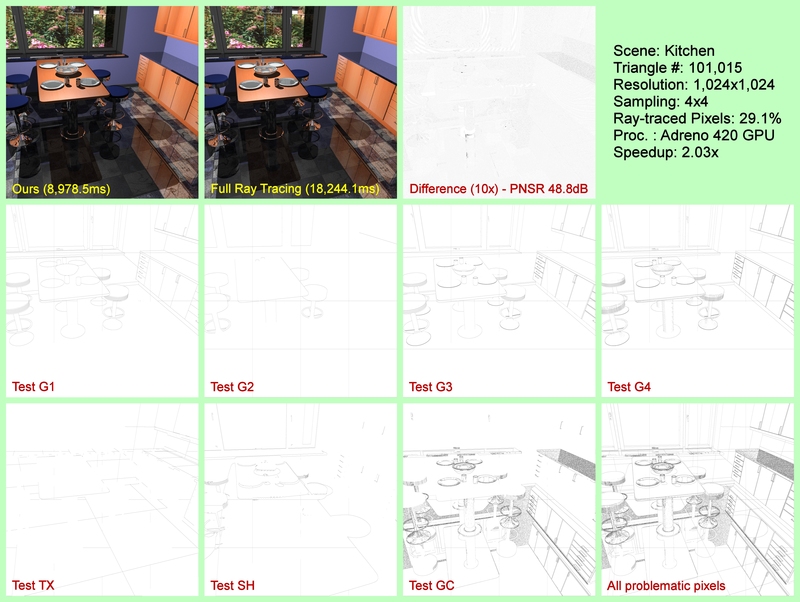 B. Chang, B. Jin, and I. Ihm, "Photon-mapping Based High-quality Real-time Global Illumination for Static Scenes", Journal of KIISE: Computing Practices and Letters, Vol. 17, No. 10, pp. 536-547, October 2011. D. Cha, Y. Yi, and I. Ihm, "Enhancement Techniques for GPU-based Rendering of Participating Media", Journal of KIISE: Computing Practices and Letters, Vol. 16, No. 12, pp. 1165-1176, December 2010. S. Kim, D. Kim, S. Woo, and I. Ihm, "Analysis of Programming Techniques for Creating Optimized CUDA Software", Journal of KIISE: Computing Practices and Letters, Vol. 16, No. 7, pp. 775-787, July 2010. S. Min and I. Ihm, "Density Estimation Techniques for Effective Representation of Light In-scattering", Journal of KCGS, Vol. 16, No. 1, pp. 9-20, March 2010. B. Chang and I. Ihm, "Performance Analysis and Enhancing Techniques of Kd-tree Traversal Methods on GPU", Journal of KIISE: Computing Practices and Letters, Vol. 16, No. 2, pp. 177-185, February 2010. D. Cha and I. Ihm, "Analysis of Harmonic Mean Distance Calculation in Global Illumination Algorithms", Journal of KIISE: Computing Practices and Letters, Vol. 16, No. 2, pp. 186-200, February 2010. 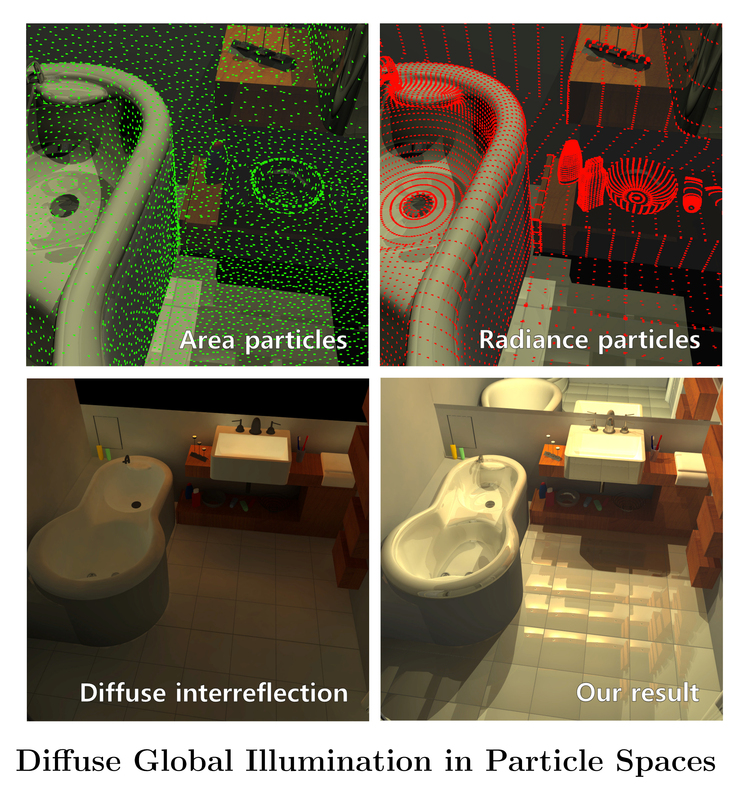 K. Song and I. Ihm, "Photon Mapping-based Rendering Techniques for Smoke Particles", Journal of KCGS, Vol. 14, No. 4, pp. 7-18, December 2008. Y. Suh and I. Ihm, "Two Efficient Methods for Generating Depth-of-Field", Journal of KCGS, Vol. 14, No. 3, pp. 31-46, September 2008. Y. Lee, D. Cha, B. Chang, and I. Ihm, "Local Parameterization of Polygonal Models Using Projection Level Set", Journal of KIISE: Computer Systems and Theory, Vol. 34, No. 12, pp. 641-655, December 2007. S. Park, W. Kim, and I. Ihm, "Development of Mobile Volume Visualization System", Journal of KISS: Computing Practices, Vol. 12, No. 5, pp. 286-299, October 2006. 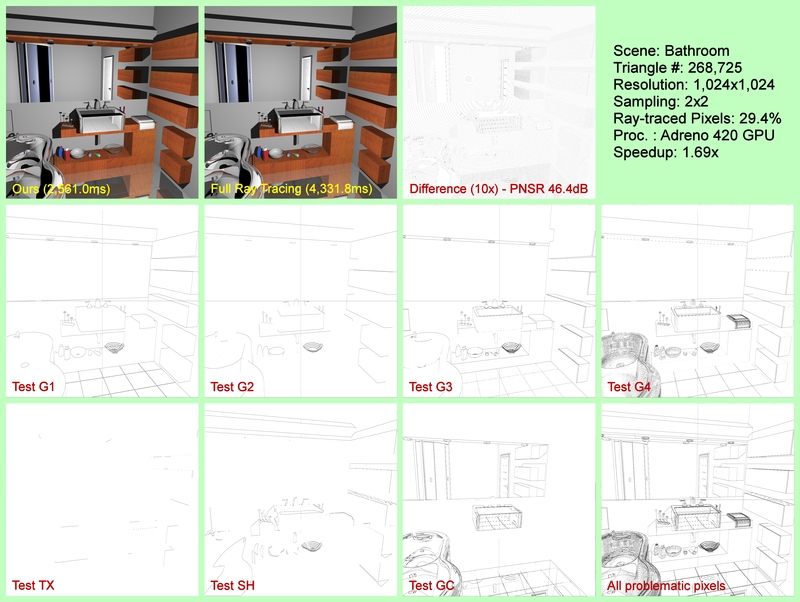 J. Kim, I. Ihm, and D. Cha, "Physically-based View-Dependent Liquid Animation", Journal of KCGS, Vol. 11, No. 2, pp. 16-25, June 2005. B. Kang, J. Kim, and I. Ihm, "Case Study: Software Development for Physically-based Water and Reactive Gas Animation", Journal of KCGS, Vol. 10, No. 3, pp. 17-27, September 2004. B. Kang and I. Ihm, "Realistic Rendering of Explosion and Flame Using Photon-Mapping", Journal of KCGS, Vol. 10, No. 3, pp. 40-51, September 2004. B. Kang, D. Cha, J. Kim, and I. Ihm, "Fluid-Dynamics-Based Animation Effects", Communications of KISS, Vol. 21, No. 7, pp. 30-38, July 2003. M. Im, J. Lee, M. Joh, S. Lee, and I. Ihm, "Real-Time Stereoscopic Visualization of Very Large Volume Data on CAVE", Journal of KISS: Computing Practices, Vol. 8, No. 6, pp. 679-691, December 2002. J. Oh and I. Ihm, "Optimization Techniques for Vertex Programming on Programmable GPU", Journal of KCGS, Vol. 8, No. 3, pp. 25-34, September 2002. H. Park and I. Ihm, "Post-Rendering 3D Warping Using Projective Texture", Journal of KISS: Computer Systems and Theory, Vol. 29, No. 7,8, pp. 431-439, August 2002. B. Kang and I. Ihm, "Exploiting Programmable Shaders in Hardware-Assisted Volume Rendering", Journal of KCGS, Vol. 8, No. 2, pp. 23-29, June 2002. S. Park, S. Park, C. Bajaj and I. Ihm, "Hardware-Accelerated Multipipe Parallel Rendering of Large Data Streams", Journal of KCGS, Vol. 7, No. 2, pp. 21-28, June 2001. J. Lee and I. Ihm, "Real-Time Shadow Generation Using Image-Based Rendering Technique", Journal of KCGS, Vol. 7, No. 1, pp. 27-35, March 2001. G. Koo, S. Park, D. Song, I. Ihm, "Compression-Based Volume Rendering on Distributed Memory Parallel Computers", Journal of KISS: Computing Practices, Vol. 6, No. 5, pp. 457-467, October 2000. R. Lee, I. Ihm, "Speed Enhancement Technique for Ray Casting Using 2D Resampling", Journal of KISS: Computer Systems and Theory, Vol. 27, No. 8, pp. 691-700, August 2000. K. Im, I. Ihm, "MIRAGE: a Multi-Server-Based Network Toolkit for Multi-User Collaboration", Journal of KISS (C), Vol. 5, No. 2, pp. 63-78, February 1999. R. Lee and I. Ihm, "On Enhancing the Speed of Splatting Using Image-Space Coherence", Journal of KCGS, Vol. 4, No. 2, December 1998. 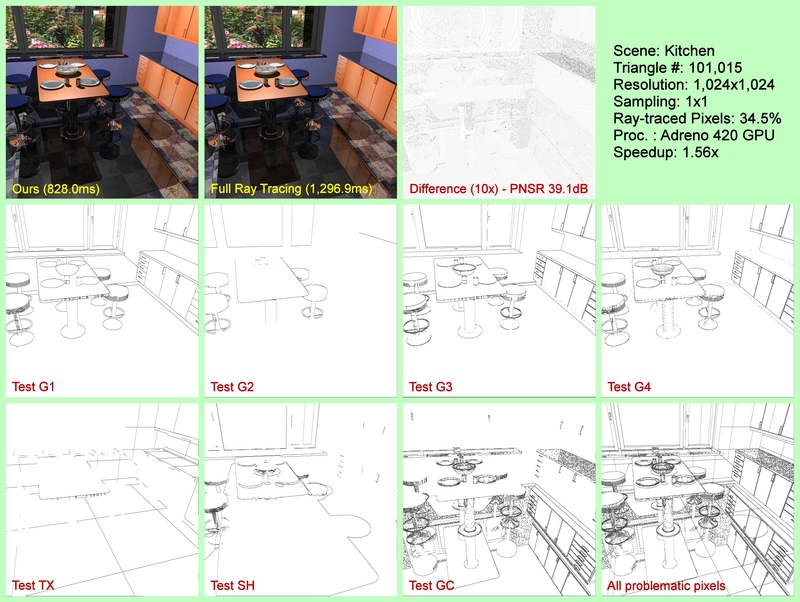 R. Lee, K. Paek, H. Han, W. Jung, H. Jung, K. Im, M. Park, I. Ihm, "Design and Implementation of an Advanced Rendering System", Journal of KISS (C), Vol. 4, No. 5, pp. 633-643, October 1998. T. Rhee, S. Park, and I. Ihm, "An Effective Visualization Technique for Huge Volume Data", Journal of KISS (A), Vol. 24, No. 9, pp. 846-857, September 1997. 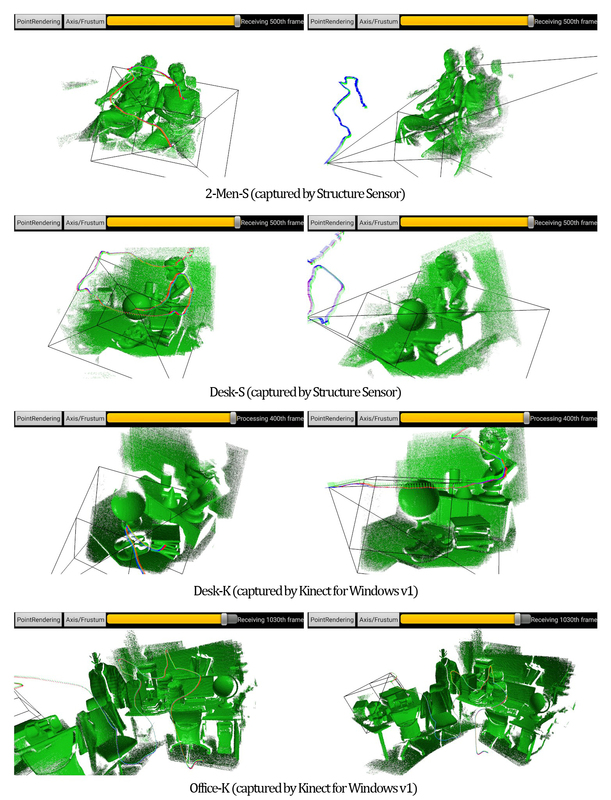 K. Paek, and I. Ihm, "SGVR: A Collaborative Volume Visualization System", Journal of KISS (A), Vol. 24, No. 5, pp. 417-428, May 1997. S. Park, and I. Ihm, "Construction of Revolved-Surface Design Tools Using Implicit Algebraic Functions", Journal of KCGS, Vol. 2, No. 1, pp. 31-38, June 1996. K. Paek, R. Lee, and I. Ihm, "Enhancing the Speed of Splatting with Indexing and Implementation of the user Interface", Journal of KISS (A), Vol. 23, No. 5, pp. 443-453, May 1996. S. Park, and I. Ihm, "Construction of Curve Design Tools Using Implicit Algebraic Functions", Journal of KCGS, Vol. 1, No. 1, pp. 11-16, March 1995. J. Lee and . Ihm, "Real-Time Shadow Generation Using Image-Based Rendering Techniques", The KISS Conference (Spring), pp.628-630, Daegu, April, 2000. D. Song, S. Park and I. Ihm, "Compression-Based Ray-Casting of Huge Volume Data on Distributed Memory Environments", The KISS Conference (Spring), pp.634-636, Daegu, April, 2000. S. YI, S. Park, and I. Ihm, "Performance Enhancement of Light Field Rendering Using a New Compression Technique", The KISS Conference (Spring), pp.653-655, Mokpo, April, 1999. G. Koo, S. Park, D. Song, and I. Ihm, "Data-Compression-Based Volume Rendering on Distributed Memory Parallel Computers ", The KISS Conference (Spring), pp.668-670. Mokpo, April, 1999. S. Park and I. Ihm, "Development of Wavelet-Based 3D Compression Scheme and Navigation System for Interactive Visualization of Very Large Volume Data", Korea Simulation Society '98, pp.114-119, Chungju, November, 1998. R. Lee, and I. Ihm, "On Enhancing the Speed of Splatting Using Image-Space Coherence ", Computer Graphics Society '98, pp.95-108, Daejun, Aug., 1998. S. Park, and I. Ihm, "Effective Compression of Very Large Volume Data", The KISS Conference (Spring), pp.359-361, Daejun, April, 1998. S. Park, and I. Ihm, "Development of Volume Navigation System SGVN for the Visible Human Data", The KISS Conference (Spring), pp.362-364, Daejun, April, 1998. S. Park, G. Koo, and I. Ihm, "Research on Effective Visualization of the Visible Human Dataset (Abstract)", '97 SERI Supercomputing Workshop, pp.28-29, Daejun,Nov., 1997. R. Lee, S. Park, and I. Ihm, "Image-Based Rendering Using Spheres ", The KISS Conference (Spring), pp.383-386, Chuncheon, April, 1997. R. Lee, K. Paek, H. Han, W. Jung, S. Eo, and I. Ihm, "Design and Implementation of an Advanced Rendering System", The KISS Conference (Fall), Yongin, Oct., 1996. T. Rhee, S. Park, and I. Ihm, "Development of Visualization Toolkits for Effective Rendering of Huge Volume Data", The KISS Conference (Spring), pp.731-734, Daegu, April, 1996. I. Ihm, and T. Rhee, "On Effective Rendering of Huge Volume Data", Korea CAD/CAM Society Conference '96, pp.234-239, Seoul, Feb., 1996. S. Park, and I. Ihm, "Construction of Revolved-Surface Design Tools Using Implicit Algebraic Functions ", Computer Graphics Society '95, pp.52-57, Seoul, Nov. 1995. T. Rhee, K. Baek, R. Lee, and I. Ihm, "Case Study: Construction of Sogang Volume Rendering System V0.55", Computer Graphics Society '95, pp.112-114, Seoul, Nov. 1995. K. Paek, T. Rhee, R. Lee, and I. Ihm, "SGVR: Construction of Scientific Visualization System for Collaboration", The KISS Conference (Fall), Incheon, Oct., 1995. R. Lee, and I. Ihm, "Speed Enhancing Technique for Splatting Using Indexing", The KISS Conference (Spring), Kwangju, April, 1995. I. Ihm, and S. Shin, "Visualization of Gaussian Curvature for Polyhedral and Volumetric Models", Computer Graphics Society '94, pp.3-8, Daejun, Oct. 1994. S. Park, and I. Ihm, "Construction of Curve Design Tools Using Implicit Algebraic Functions", Computer Graphics Society '94, pp.92-97, Daejun, Oct. 1994. (C) 1993-2007 Sogang Computer Graphics Lab.